More than a dozen motorists have been caught using their mobile phones while travelling along the A11. 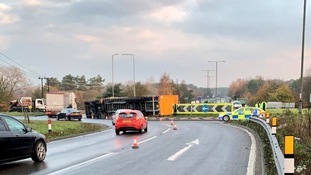 Police attended the scene on Wednesday after a lorry overturned on a roundabout at Thetford. While dealing with the incident, Norfolk and Suffolk Roads and Armed Policing Team reported 13 drivers for driving and using their mobile phones to take pictures of the road traffic collision.